Somewhere in the Merendon mountains of northwest Honduras, shrouded by the clouds, exists a region noted for its richness in plants and animal species. This biodiversity hotspot, dubbed the Cusuco National Park, was established in 1987. Other than providing clean air and water supply for San Pedro Sula, the second largest city in Honduras, this park also hosts over 260 species of birds, gem beetles, and various cat species such as the jaguar, margay, and ocelot. Hidden behind the leaves and under the trees, however, are the unsung heroes of the rainforest. 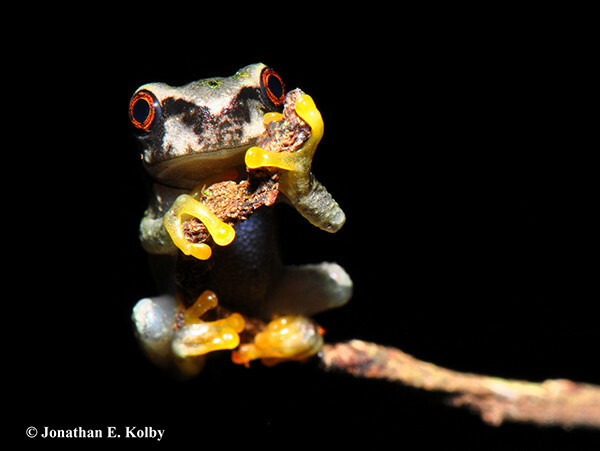 Frogs, despite their global distribution, are often overlooked by many. These hoppy critters feed on insects, keeping mosquito population in check and preventing mosquito-borne diseases from spreading. Some species also browse on algae, ensuring water stays clean and safe for human consumption. Not only do they play crucial roles in our wellness, each one of the frog species from Cusuco National Park has its own quirks. The Cusuco spike-thumb frog (Plectrohyla dasypus), for example, is an arboreal species which mainly lives up in the trees — but will occasionally free-dive and burrow under the ground when threatened. This species is identifiable by its lustrous bronze body, with black spots bordered by striking lime-green rings. Its close relative, the exquisite spike-thumb frog (Plectrohyla exquisita), is more modest in appearance. This species’ coloration ranges from creamy brown to leafy green, with black pupils on round, opaque white eyes which look like veiny glass marbles. Despite its formal recognition in 1998, researchers specializing in the area have never heard the frog croak. The mossy red-eyed frog (Duellmanohyla soralia), is known to have stunning patches of bright green spots, and obviously, blood-red eyes. 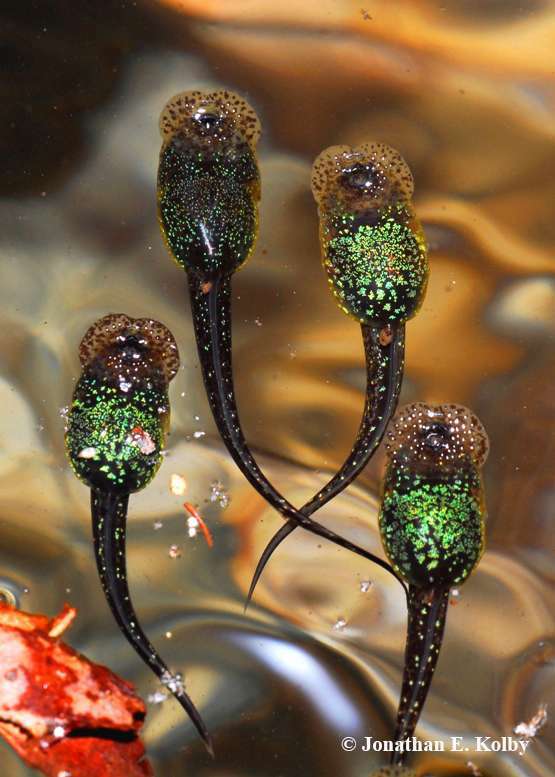 The tadpole of this species has glittering green spots on its pitch black body, and has been seen to swim upside down for unknown reasons. Unfortunately, not unlike a large number of amphibian populations throughout the world, these frogs are also threatened by chytridiomycosis. The infectious disease, first discovered in 1998, is caused by a species of chytrid fungus which infects the animals’ skin. This infection hinders the skin’s function to provide oxygen, hydration, and regulate body temperature. In some cases, the disease causes 100% mortality to the affected population. One group of researchers under the name of Honduras Amphibian Rescue & Conservation Center (HARCC), led by PhD candidate Jonathan Kolby, attempts to help the frogs overcome this deadly threat. By collecting and rearing tadpoles in their safe facility, HARCC expects to release mature frogs back into the wild after they develop stronger immunity. HARCC is also attempting to operate a captive breeding program, as a safety measure should the wild populations be threatened in one way or another. This conservation program will not only help the frogs of Honduras, but also advance the cumulative scientific knowledge necessary to combat chytridiomycosis. In this world where one disease has the potential to wipe out 30% of some 7,000 amphibian species, a quick action needs to be taken before the frogs disappear for good.